HIV Rapid Test. 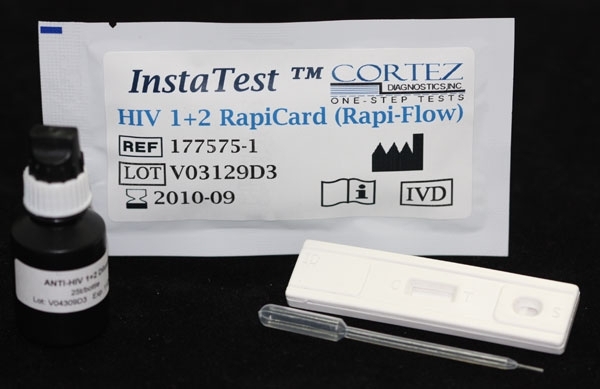 This one-step Anti HIV 1, 2 RapidCard™ is a rapid, binding-screening test for the presence of antibodies to HIV 1 and HIV 2 viruses. It is used as an aid in the diagnosis of HIV infection. This HIV Rapid Test is based on the principle of inter-second antibody immunoassay for determination of antibodies to HIV-1 and HIV-2 in wholeblood/serum/plasma. Purified recombinant antigens are employed to identify anti-HIV 1 and HIV 2 specifically. This one step test is very sensitive and only takes 20 minutes for the result to be read. Test results are read visually without any instrument.